An Indigenous Water Protector and an Alpine, Texas, resident were arrested Saturday morning after locking themselves to pipe-laying equipment at an Energy Transfer Partner (ETP) easement and work site in Presidio County, Texas. The lockdown temporarily halted construction on the company’s 143-mile Trans-Pecos pipeline that, if completed, would carry 1.4 billion cubic feet of fracked gas from West Texas to Mexico every day. 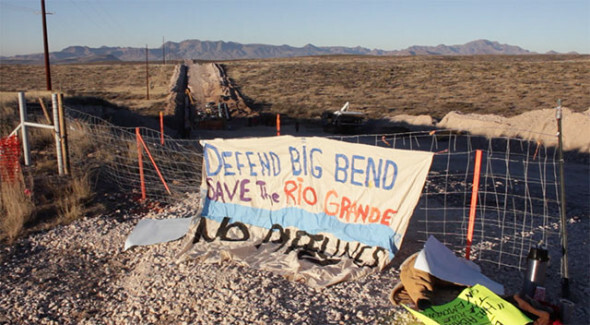 The action was the first to be organized by a new Indigenous-led prayer and resistance camp on private land in far west Texas’ pristine Big Bend region. The camp is acting in solidarity with the Sacred Stone and Oceti Sakowin camps’ historic standoff against the Dakota Access pipeline at the Standing Rock Sioux reservation in North Dakota. The same Dallas-based company is behind both the Trans-Pecos and Dakota Access pipelines. Jakki Hagans and Mark Glover, the two Water Protectors arrested Saturday, have been working to organize the “Two Rivers” or “La Junta de Los Rios” camp as members of the Society of Native Nations (SNN) and the Big Bend Defense Coalition (BBDC), respectively, during the last several weeks. They were each charged with trespassing and released on $250 bonds that same afternoon. The high-pressure Trans-Pecos pipeline is already close to completion and is billed to run from Coyanosa, Texas to the border near Presidio, Texas — cutting right through the heart of the Big Bend area’s ecologically sensitive Chihuahuan desert bioregion, a place that is both breathtakingly serene and extremely remote. The region is one of the only areas of the state that has, until now, remained unadulterated by oil and gas infrastructure. Mexican billionaire Carlos Slim, who was the world’s richest man from 2010 to 2013, and ETP CEO Kelcy Warren head the pipeline project. 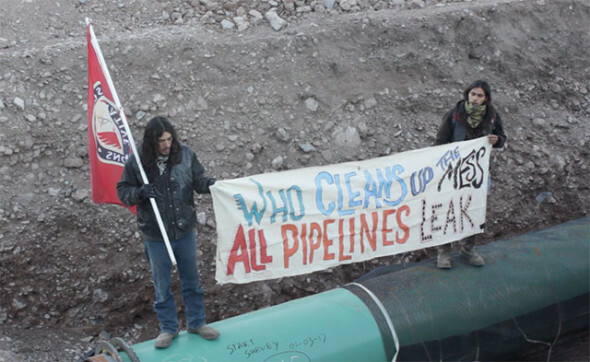 Saturday’s lockdown is not the first direct action to target the Trans-Pecos pipeline. 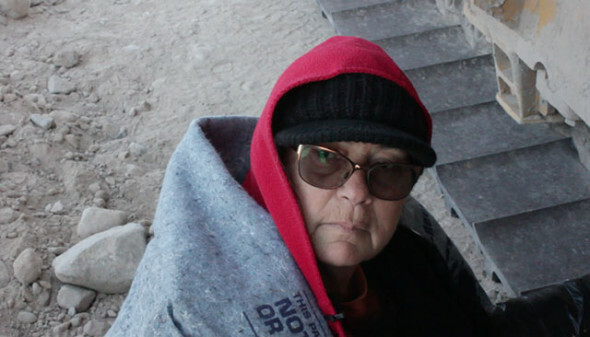 On December 6, three Alpine residents with the BBDC chained themselves to the entrance gates of an ETP construction site, halting work on the pipeline. That was before the Two Rivers camp was up and running, and this weekend’s action consecrates the aims and ambitions of the new camp, whose elders facilitated a prayer ceremony before Saturday morning’s lockdown and regularly led sacred practices at the Two Rivers camp. 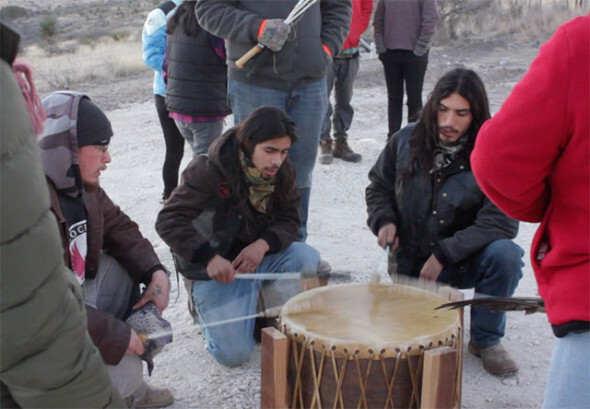 A second camp in Alpine, Texas, is also supporting the Water Protectors. In fact, Two Rivers’ elders and Water Protectors are working directly with Indigenous leaders at Standing Rock. An Indigenous Environmental Network delegation from Standing Rock is planning to meet with Indigenous Water Protectors at the Two Rivers camp this week to engage in prayer and ceremony, and to provide additional training to the camp’s new Protectors as they anticipate dozens more will flock to the camp in the coming weeks. The land the pipeline has horrifically scarred is Lipan Apache and Conchos territory, and the Native Water Protectors organizing the Two Rivers camp say they are protecting their sacred sites in much the same way Standing Rock’s Water Protectors are. Truthout has previously reported that many such sacred sites, including potentially Indigenous burial sites, have already been destroyed or are threatened. Alpine archaeologist and member of the Big Bend Conservation Alliance David Keller told Truthout he witnessed ETP’s bulldozers in September grinding through an 18-acre area on private land in Brewster County surrounding a desert watering hole called Trap Spring. The site is home to artifacts from the Late Archaic period, including at least 10 bedrock mortars, seven robust ring middens — what Keller calls “earth ovens,” dating back more than 5,000 years — seven prehistoric hearths and two stone enclosures believed to have been used for wikiups or tipis. The site is rare in the region due to its particular historical significance, according to Keller. The site was once part of a larger formation of spring vents along the eastern front of the Davis Mountains, and is situated along an ancient trail network stretching from Mexico up through Leon Springs in Fort Stockton, Texas, and on farther north. It contains arrowheads and glass beads once heavily traded along the trails. ETP claims to have adjusted its construction route to avoid disturbing the artifacts after its own archeologist recommended the site be avoided. However, Keller said that ETP has only tested for cultural relics one foot beneath the topsoil even though many artifacts in the area of the floodplain of the Rio Grande are at least three feet beneath the surface. The Trap Spring site’s State Archaeological Landmark status was pending at the time ETP set its bulldozers to it. The Two Rivers Water Protectors are also fighting for state and federal recognition of Texas tribes. The state of Texas has only recognized two tribes, the Lipan Apache and the Texas Band of Yaqui Indians, and many unrecognized tribes don’t have access to legal protections for Indigenous remains and artifacts that also mandate consultation with tribes, such as the 1990 Native American Graves Protection and Repatriation Act (NAGPRA) and section 106 of the 1966 National Historic Preservation Act. Those protections only apply to federally recognized tribes and/or federal agencies or projects dealing with federal funds, permits, licenses or lands. Only three federally recognized tribes reside in the state — a reflection of the history of federal and state extermination campaigns, family separation, and forced relocation and assimilation. Two Rivers Indigenous Water Protectors also oppose ETP’s other pipeline project that will carry fracked gas to Mexico. Even the project’s name is racist: ETP’s “Comanche Trail” pipeline takes its label from the Comanche Nation who were forcibly removed from Texas in the aftermath of the Comanche Wars. During the conflicts, the tribe used the Comanche Trail that crossed West Texas through the Big Bend region. The Two Rivers camp’s Indigenous-led resistance is taking shape in Texas’ border region, and is about a 40-minute drive from a Homeland Security border checkpoint. Resistance around the “Comanche Trail” pipeline is responding to a unique set of political circumstances, since the federal government itself appears cautious about plans for the pipeline. Two Rivers Water Protectors say the border reveals the federal government’s priorities when it comes to regulating pipelines, noting that while the federal government easily greenlit ETP’s pipelines to cross major waterways like the Rio Grande and the Missouri River (before historic Indigenous resistance), it showed more hesitation regarding ETP’s plan to route the Comanche Trail pipeline under the border fence and under the federally-owned Franklin Canal, filing an injunction to halt construction on the pipeline in November, and filing another motion to ensure the Department of Homeland Security has an opportunity to review ETP’s route. However, Two Rivers Water Protectors emphasize that the US/Mexico border has little relevance, when it comes to their sacred sites and sacred lands. “A lot of the lands that [ETP] is going through are sacred sites of Indigenous people from this land on both sides of the border. That border didn’t always exist. This land was very sacred to them, very important to them. There’s burial grounds everywhere, there’s places they lived, as they moved and transitioned throughout this land,” Orona told Truthout. Kiani Naranjo, another Two Rivers Water Protector who descends from the Lenca people of El Salvador, agrees. “This land was originally part of the Americas before colonization, so before there was borders and before we were separate countries, it was all one land that belonged to the Indigenous people of the Americas, which is my ancestors and my future descendants, hopefully, and the ancestors of all my brothers and sisters that are here,” she said. The Water Protectors and their allies want full environmental assessments on the entire length of both pipeline projects, not just for the areas that would be crossing the border. Opponents of the Trans-Pecos pipeline have been pushing for such a review for some time. As Truthout has previously reported, the fight against the Trans-Pecos pipeline has been ongoing for more than two years. Throughout that time, conservationists, landowners and area residents have filed hundreds of comments with the Federal Energy Regulatory Commission, which is tasked with regulating a portion of pipeline slated to cross under the Rio Grande. The Two Rivers Water Protectors fear the Rio Grande may become contaminated and they requested that the agency conduct an environmental review of the pipeline, but the request was denied last May. Moreover, landowners have banded together to oppose the company’s use of eminent domain, filing several suits against ETP over condemnations of their property. As Truthout has reported, while ETP and Carlos Slim have said the fracked gas is intended for Mexico, where furious “gasolinazo” protests and blockades over a 20 percent hike in state-set fuel prices are heating up, the reality is that the gas would be shipped overseas to Japan, where officials are looking to shut down nuclear power plants and replace that energy supply with fracked gas after the Fukushima disaster. The primary financial backers of the pipeline include the Bank of Tokyo-Mitsubishi and the Sumitomo Mitsui Banking Corporation in Japan, according to industry reports. Beyond the pipeline, Two Rivers Water Protectors say they hope they can galvanize a larger resistance to the development of the recently discovered Wolfcamp shale field in West Texas, the largest shale field ever assessed in the US. The shale contains 20 billion barrels of oil and 16 trillion cubic feet of natural gas. 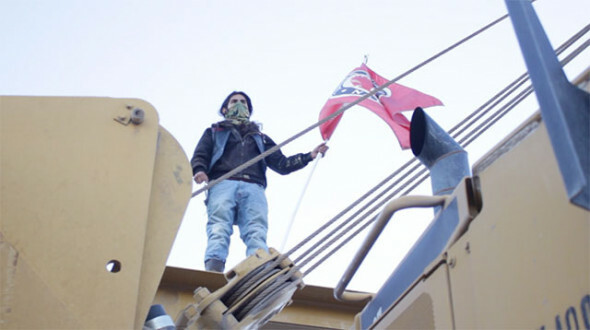 That resistance is already taking shape with another camp in Toyahvale, Texas, which formed concurrently with the Two Rivers camp. The city is home to the locally known and loved spring of Balmorhea State Park, and hopes to stop the development of the nearby shale fields by the Apache Corporation. The Houston-based company announced last fall that it could drill up to 3,000 wells over the next two decades. As the oil and gas industry continues to cement its dominance over the legal and regulatory process in Republican-dominated statehouses — as well as federally, under an incoming Trump administration — actions like Glover’s have become all the more necessary.